When most people look at Prince Harry, they see a confident, happy man but just recently he revealed that he has had counseling to deal with the death of his mother Princess Diana. In a 25 minute interview, Prince Harry revealed that he kept the grief of his mother’s death inside which led to feelings of aggression. Prince Harry was known to box and he says that helped him cope with the feelings and the aggression. Prince Harry opened up revealing that he had been close to a complete breakdown on numerous occasions. Some mental health officials in England have stated that Prince Harry‘s honesty may have done more for communicating mental health issues in just a 25 minute interview than they have done in their careers. Prince Harry felt it was necessary to reach across the world and share his message of mental health, hope and that it is never too late to seek and look for help. Prince Harry and his decision to open up is being praised for showing others that attitudes about mental health are changing for the better. Prince Harry felt it was necessary to show to the world that no one should adopt the “stiff upper lip’ approach to mental health, instead we need to be able to talk openly about mental health, something that affects all of us. 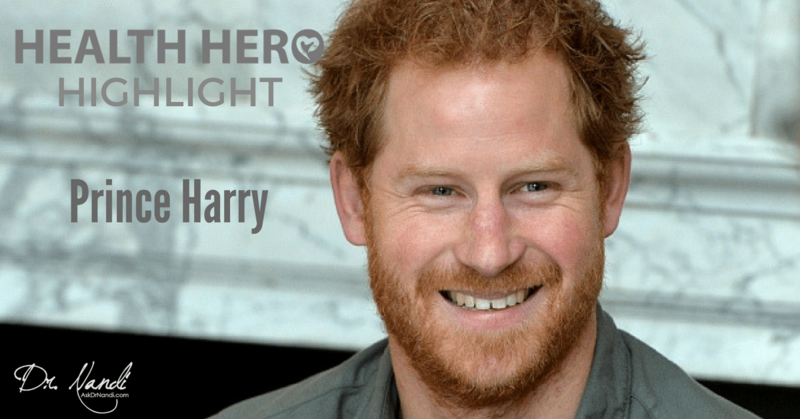 Prince Harry is this week’s Celebrity Health Hero because of his courage and his belief that mental health is not a stigma, but a disease.